South Korea’s top steelmaker Posco finished 2018 with the highest operating profit above 5 trillion won ($4.48 billion) for the first time in seven years thanks to brisk sales of premium steel products and solid performance of its affiliates. Posco said in a regulatory filing on Wednesday that it raised 5.54 trillion won in operating profit last year on a consolidated basis, up 19.9 percent from a year ago. It was the first time in seven years for the steelmaker to raise more than 5 trillion won in operating income since 2011. It was also a seven-year high. Sales jumped 7.1 percent to 64.98 trillion won. Net profit, however, fell 36.4 percent to 1.89 trillion won last year from a year ago largely due to one-off losses from the discontinued synthetic natural gas business and higher corporate taxes. Posco’s operating margin stood at 8.5 percent in 2018. 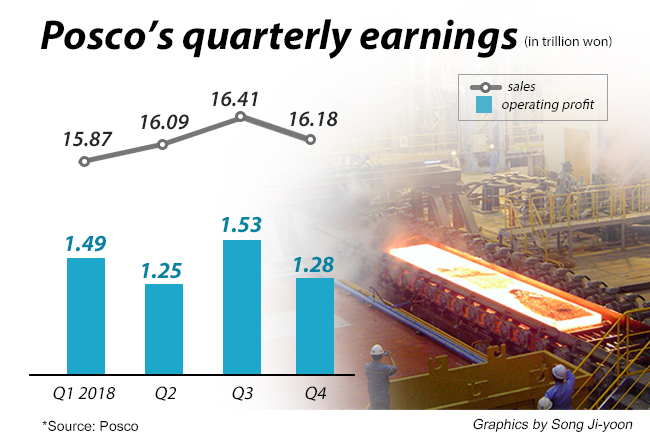 Posco said it managed to rake in over 1 trillion won in operating income on a consolidated basis in the October-December period for a sixth consecutive quarter thanks to brisk sales of high-end steel products and improved performance by its affiliates offsetting weakening demand, a slowdown in global economy, and growing protectionism on the global trade front. Among local affiliates, trading arm Posco Daewoo and construction unit Posco E&C saw improvement in their earnings from the previous year thanks to solid global steel demand and the local housing boom, respectively. Its Indonesian and Malaysian steel producing affiliates PT. Krakatau Posco and Posco Maharashtra also reported stellar results on strong steel demand. The company’s financial soundness has also improved after it paid back 854.4 billion won worth of debt last year to bring down overall debt level from the previous year. The company’s debt ratio on a consolidated basis rose slightly by 0.8 percentage points to 67.3 percent but still lowest since 2010. 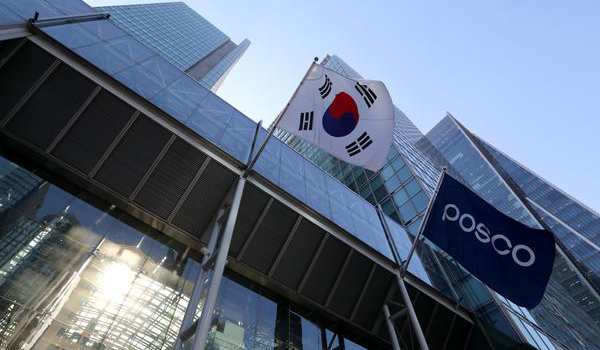 Posco said in a separate filing that it will pay cash dividends of 10,000 won per share, 2,000 won more than what it had paid for the past six years, in a move to enhance shareholder return policy.